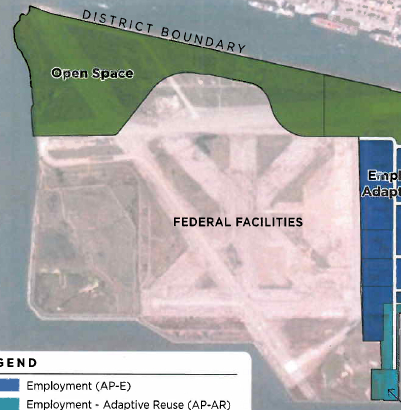 The environmental review process for Alameda Point has begun. Attached to the city’s notice of preparation, the proposed zoning map shows a couple of disturbing changes. The city has redrawn boundaries and changed a land-use designation. What gives? How can our base reuse plan, which included a wildlife refuge, be changed without public input? And is city staff, through the environmental review process, attempting to unilaterally revise the city’s January 2012 memorandum of agreement (MOA) with the Navy by redefining the properties the Navy will convey? The proposed map shows the city is planning to give up a chunk of the property it was to receive, which will now go to the Veterans Administration for “federal facilities” that include a 120-acre clinic and columbarium. This carve-out conflicts directly with the MOA, which provides that the “entire” Northwest Territories will be conveyed to the city for open space/parkland purposes. There is no record indicating the MOA was ever amended or revised. In addition, chapter 9 of the city’s general plan states that the city will “help maintain a Wildlife Refuge that balances natural conservation with public access [and] education” and lists a number of “implementing policies” designed to achieve that goal. The base reuse plan expresses the same sentiment. 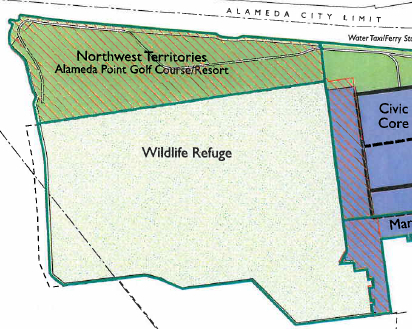 There is no zoning on the proposed map for a wildlife refuge, implying a change in vision. This is the first time the city has presented the change of boundaries and proposal to zone away the wildlife refuge. These major decisions should not be made behind closed doors without public discussion and then presented as part of the environmental review packet as if it’s a done deal or no big deal. Not only are we giving up land, we’re signing away our wildlife refuge. While I support the VA’s project in Alameda, we can’t move forward without addressing these issues in a public forum. These plans have everything to do with our city and our goals. While the VA may want to reserve its ability to one day develop the entire site, the city should not facilitate that development through rezoning the area now. We should instead hold firm to our vision for wildlife, natural habitat, recreation, and scenic/visual value. There is plenty of other space at Alameda Point for the VA to build more facilities if they ever want to. The VA’s 511 acres outside the clinic and columbarium area should be zoned as open space. Let’s involve the public in the decisions on changing boundaries and the future of our wildlife refuge. The deadline for submitting comments on the environmental review is March 1. Send comments to Planning Services Manager Andrew Thomas <athomas@ci.alameda.ca.us> at city hall, 2632 Santa Clara Avenue. Originally published in Alameda Sun. This entry was posted in Alameda Point, Environment, Parks and Open Space and tagged Alameda Point, EIR, environmental impact report, VA, Veterans Administration, wildlife refuge, zoning. Bookmark the permalink.